Searching for a reliable wireless solution for your project can be a real pain if you're not familiar with current wireless standards, data rates and reliability. The Xbee Modules that we will use in this article are widely available, use a very reliable wireless transmission protocol and have sufficient datarates for most hobby projects. This article will show you how to build a basic wireless input and output system in the form of a single transmitter and single receiver. Communication will be one way to keep things simple with two xbee modules being used for the wireless link. In the end, a small trimpot will control the movement of a servo motor. 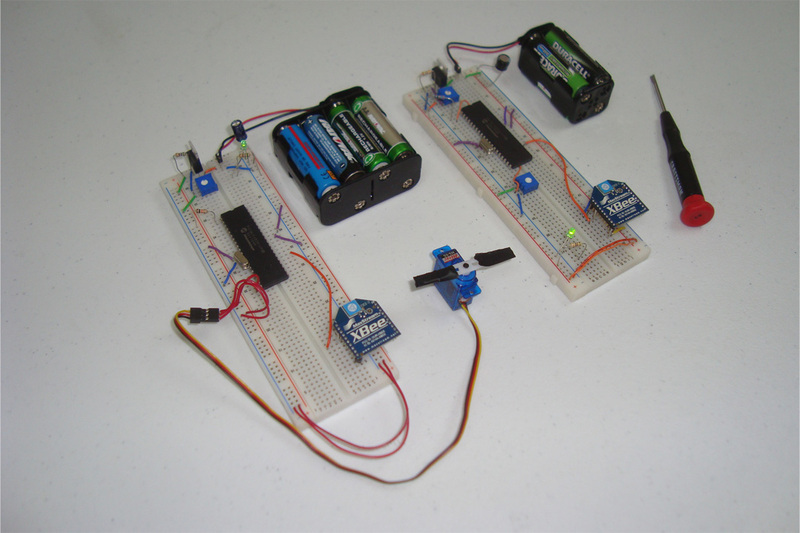 The goal for this article is to build a wireless transmitter that we can send input to and a wireless receiver that can recieve, translate and implement this input data to move a servo motor to a specific location. To arrive at this goal, we will use two PIC Microcontrollers (one for the receiver and the transmitter) and two Xbee WiFi Modules (again, one for the receiever and the transmitter). The transmitter will have a standard trimpot circuit to input a variable analog voltage to the PIC's A/D converter. The receiver will be connected to a servo motor that can be driven by a PWM signal.